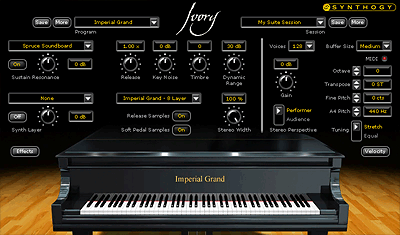 Ivory is a groundbreaking Grand Piano Virtual Instrument featuring 40 Gigabytes of stunning, all new samples of Steinway D, Bosendorfer 290 and Yamaha C7 Grand Pianos. • Over 40 Gigabytes of stunning, all NEW, Acoustic Grand Piano sampled instruments: German Steinway® D 9' Concert Grand, Bösendorfer® 290, Imperial Grand, Yamaha® C7 Grand (Each piano can be installed separately). » With Version 1.5, Each Piano now has up to 10 stereo dynamic levels with real release and soft pedal samples. » Synthogy's powerful custom 32 bit sample playback and DSP engine. » DSP for realistic damper pedal response. » World class Digital FX including ambience, chorusing and EQ. User controls for Timbre, Stereo Width and Perspective, Velocity Response, Mechanical Key Noise, Tuning and many others. » Synth pad layering for creating modern sounds. » Control over resource usage for optimum CPU performance. 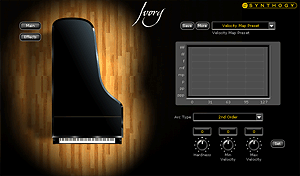 Вы можете получить более детальную информацию о диске "IVORY - Grand Pianos VSTi v1.5 [10 DVDs Set]" на сайте производителя. 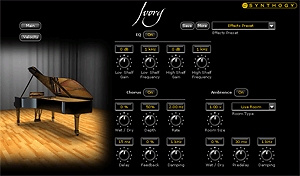 На нашем сайте вы можете скачать или купить почтой IVORY - Grand Pianos VSTi v1.5 [10 DVDs Set]. Этот товар поступил в продажу в наш магазин 22 Февраль 2006 г.